Calgary is a city in the province of Alberta, Canada. 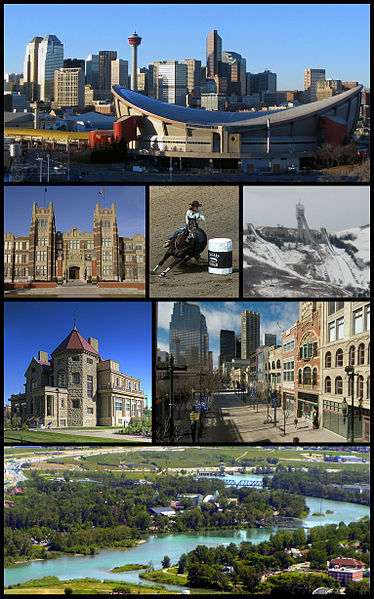 As of the 2011 census, the City of Calgary had a population of 1,096,833, making it the largest city in Alberta, and the third-largest municipality in Canada. Calgary has cold, dry, but highly variable winters and moderately warm summers. The climate is greatly influenced by the city's elevation and proximity to the Rocky Mountains. Average daytime high temperatures in range from 24 °C in late July to −3 °C in mid-January. Calgary is among the sunniest in Canada, with just over 332 days of sun. Most of the precipitation occurs from May to August, with June averaging the most monthly rainfall.